The Chicago Blackhawks will once again have to deal with an existence without goaltender Corey Crawford, as he was placed back on injured reserve Wednesday. 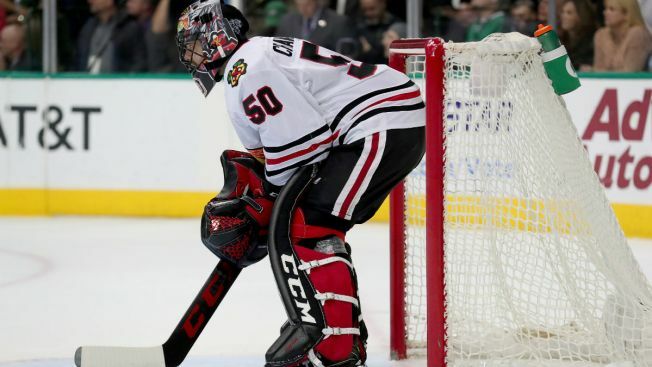 There is no timetable for when Crawford will return, with Joel Quenneville saying that the netminder will miss "a bit" of time with an upper body injury, according to Mark Lazerus of the Chicago Sun-Times. "I'm going to say indefinite now until we get him on the ice and know more." Crawford, who spent a week on I.R. earlier this season, has been one of the league’s best goaltenders, with a 16-9-2 record and a 2.27 goals against average this season in 28 games. He was yanked from his last start after giving up three goals against the New Jersey Devils, but had been strong prior to that game. To replace Crawford, the Blackhawks called up a pair of players, with goaltender Jeff Glass and forward David Kampf both recalled from the Rockford IceHogs. Glass has been playing frequently for the IceHogs with Jean-Francois Berube out due to injury, and he’s been playing well. He has a 10-4-1 record and a 2.60 goals against average this season, and he could make his NHL debut if the Blackhawks opt to give him a start over Anton Forsberg. In 30 games in his first season in the U.S., Kampf has scored seven goals and dished out 10 assists for the IceHogs. The Blackhawks will next take the ice on Thursday night when they head to Vancouver to take on the Canucks for their first post-Christmas skate.